Choi Cheolhan (r) won the Maxim Cup on Tuesday, April 6, defeating Kang Dongyun (l) by resignation in the third and final game to win the 11th Maxim title match 2-1. Choi has now won the Maxim Cup two years in a row. 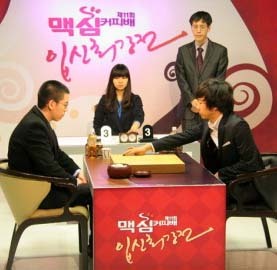 The Maxim is sponsored by Baduk TV and Dong Suh (East-West) Foods Co.